We had better start by getting the obvious out of the way. The Vic 20 was not a powerful machine. Your average Vic 20 game had to be programmed in less than 3,583 bytes. To put that into context, a modern mobile phone with sixteen gigabytes of storage has approximately 4.7 million times more memory at it's disposal than a standard Vic 20 had. To have produced any games at all within such limitations is a miracle within itself. The fact that some of those games were, in reality, really quite fun and playable, would perhaps be almost unbelievable to the gamer of today. Some games however couldn’t be delivered within such tiny memory constraints, so they utilised the machine’s expandability, coming on cartridges which could be directly plugged into the memory expansion slot. This meant that the Arcade classics of the time could be played at home, with excellent cartridge versions of Space Invaders, Glaxian, Defender and Pac Man among others being available. Game developers also used the extra memory to push the boundaries and for the first time we saw a series of text ‘adventure games’ that could be played on the Commodore home computer. 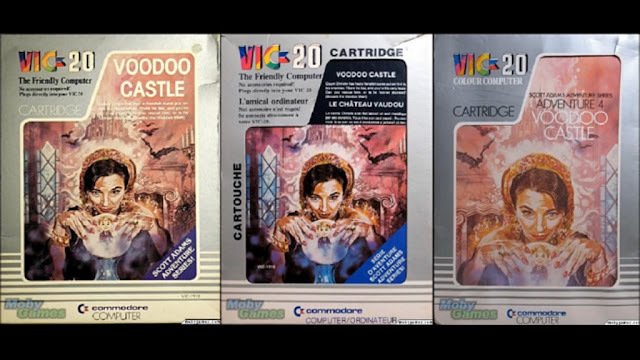 The Scott Adams adventure games released on cartridge for the Vic 20 included ‘The Count’, ‘Adventure Land’, ‘Secret Mission’ and ‘Pirate Adventure’ and I played them all, but the one that I remember most fondly is ‘Voodoo Castle’. The game is effectively an unfolding story, told purely by text on screen, driven by the user by inputting a series of two word commands, normally one simple verb and one noun, for example: “use saw”, “take lamp” or “eat food”. You can also direct your player using ‘North’, ‘South’, ‘East’ and ‘West’ as well as ‘Up’ and ‘Down’. Each time you move you are told where you are and what you can see. Graphics? No there aren't any. Sound? Nope. This is a game purely for your imagination, but it embraces it and takes it partying. ​You are required to navigate the play area, collect and use items, solve puzzles and eventually complete your quest, which in this case is to wake Count Cristo who is lying asleep in a coffin at the start of the game. As the number of rooms you visit and complexity of routes between them increase, it becomes necessary to chart your progress with pen and paper, drawing ever more complicated maps accompanied by extensive notes to remind yourself what was where. When providing a reviewer's opinion it is only fair to remember that these games are nearly as old as I am. For their time they were fantastic fun, offering something very different for the average gamer. Using your brain, working out the (sometimes rather obtuse) puzzles and progressing was enjoyable and particularly rewarding in the early 1980s. At the time, with no internet and walk-throughs available, they were (although in reality quite short) games that took many hours, days, weeks and even months to complete. However, while great fun for their time, it must be said that in this day and age they certainly don’t offer the same enjoyment, indeed there were some issues that make them decidedly infuriating. Let's not forget that this is still a pretty small game in terms of memory and tricks have to be played to increase it's longevity. Some puzzles are really quite un-intuitive, in fact the game will often try and misdirect you, telling you that certain actions cannot be done "yet", heaviliy insinuating that they can in time, wheras in reality a lot of these were complete red herrings. There is a lot of trekking back and forth and not really achieving anything and, most annoyingly, you can die; abruptly and without warning, which, if you are some distance from your last save, can be extremely frustrating. ​If you are a younger gamer and would like to see what adventure gaming looked like nearly forty years ago, then have a look, though don't be surprised if you are disappointed. For the older gamer, while still frustrating and simplistic in equal measure, the game will also offer a proper full-on belt of retro-gaming nostalgia which really will take you back.